The National Weather Service confirmed late this afternoon that the tornado yesterday in Menifee and Morgan Counties was rated EF3. The tornado at Salyersville in Magoffin County was also an EF3. According to the National Climatic Data Center database of storm reports, these are the first EF3 or higher tornadoes ever reported in these 3 counties since official records began in 1950. In fact, only 1 tornado as strong as F1, on 06/02/1990, has been reported in Menifee County. The strongest previous tornado in Morgan County was an F2 on 09/29/1972. 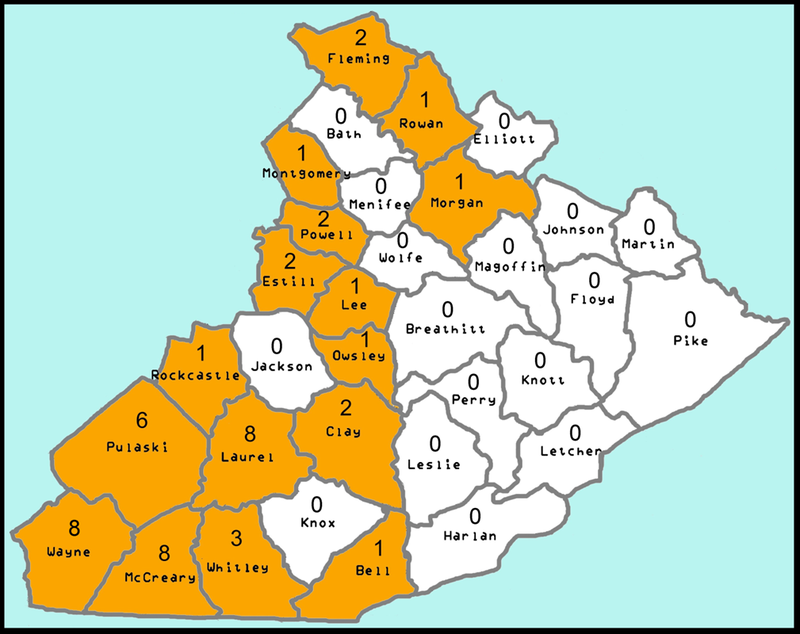 Magoffin County has had no previous tornadoes as strong as F1 and only 1 F0. 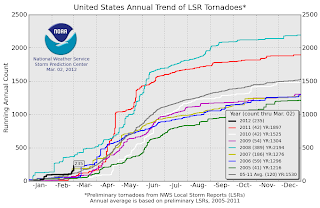 Although preliminary reports are subject to later verification, yesterday's massive tornado outbreak in the Ohio Valley and Southeast was on a record pace for so early in the season. 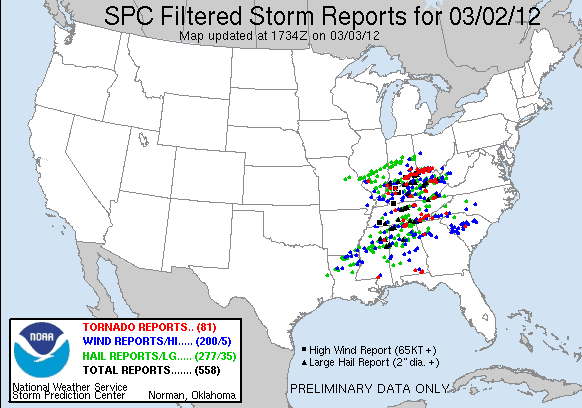 Filtered to remove duplicates, the Storm Prediction Center (SPC) preliminary data includes 81 tornado reports in the 24 hours ending at 7 am EST today (March 3). 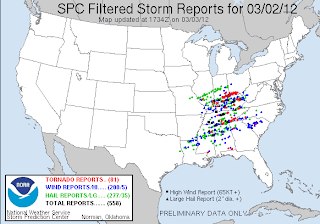 Including high wind and hail, there were 558 total severe storm reports. In all of these cases, however, the large totals were accumulated much later in the month. 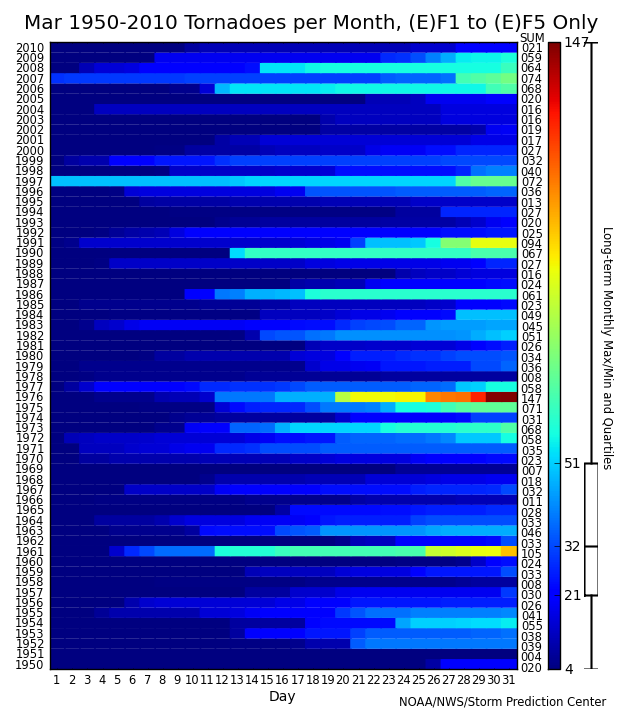 For example, National Climatic Data Center historical data show only 17 tornado reports in the first 11 days of March 1976. 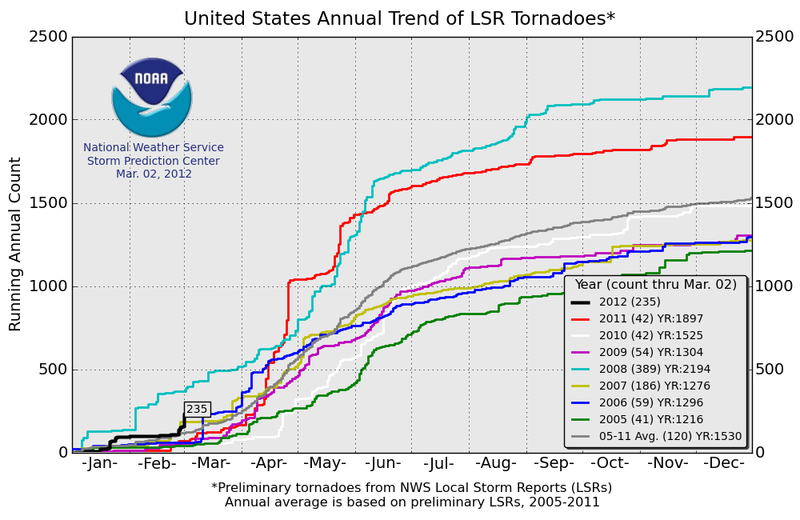 The maximum numbers of tornadoes for earlier months in the year were 109 in January 1999 and 89 in February 2008. Preliminary data from the National Weather Service indicate that the winter of 2011-12, ending today, was the 4th warmest at Philadelphia since official climate records began in 1872. The average temperature of 40.7° was 0.3° warmer than the previous 4th warmest winter in 1997-98. As was the case in New York, the 12th of February was the only day this month with below-average temperatures. Preliminary figures from the National Weather Service indicate that the winter of 2011-12, ending today, was the second warmest in climate records extending back 143 years at Central Park in New York City. 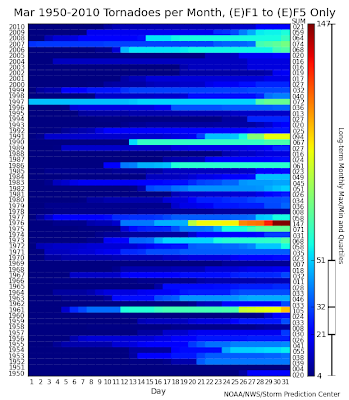 The winter average temperature of 40.5° was 0.4° above the previous second warmest in 1931-32. 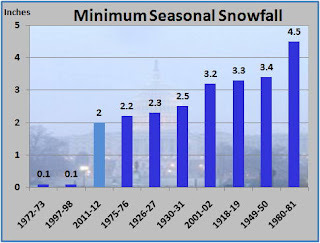 Each of the 3 winter months was well above the long-term average. In February, only one day, the 12th, with a high of 32° and a low of 20°, was below average. WINTER IN BALTIMORE WAS 1931-32...45.3F. 2001-02. THE PERIOD OF RECORD AT DULLES GOES BACK TO 1962. 1 AM Update: Woot! A high temperature of 56° just before 11 pm rounds up the winter average to 43.4°. 10 PM Update: A temperature of 55° at this hour puts the winter average within 0.005 of rising by another 0.1° to 43.4°. 5 PM Update: The exact final result may depend on how the National Weather Service accounts for leap year, but today's preliminary high as of 4 pm is 52°, which virtually locks in the winter average at 43.3°. Since a further rise of 2° on southerly winds through the evening is not out of the question, the average could actually bump up, as noted below. 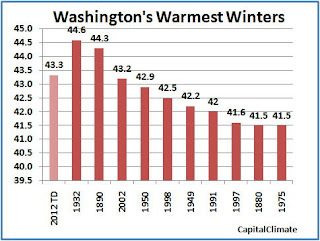 With a 2 pm temperature of 51°, following a jump of 6° in the previous hour, and an overnight low of 40° on Leap Day, Washington, DC has maintained a 2011-12 winter average temperature of 43.3°, which edges out 2001-2002 by 0.1° as the 3rd warmest winter in over 140 years of climate history. A further increase of just 3° in this afternoon's temperature would raise the final seasonal average by another 0.1°. On the other hand, because of rounding, it would require a highly-unlikely drop of at least 7° in the daily low (to 33°) before midnight to reduce the average by 0.1°. 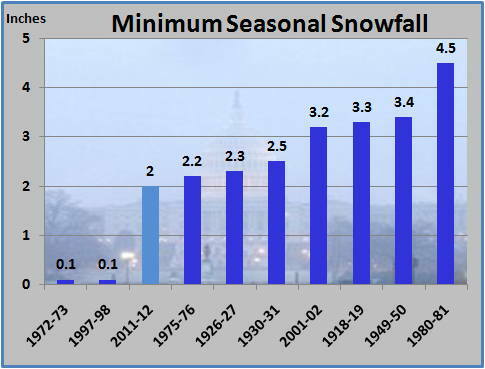 Although March snow is not completely out of the question (see "Not the March of the Penguins"), this winter is also the 3rd least snowy on record. A Calvert County man died Saturday afternoon when a root ball the size of a small car rolled onto him while he was cutting up a toppled tree, authorities said. Brian W. Buck, 50, of Lusby was working on an oak tree that fell last August during Hurricane Irene, said Lt. Steve Jones of the Calvert County Sheriff’s Office. When a large log rolled into the hole where the tree once stood, Buck jumped into the hole to retrieve the log. A root ball estimated to weigh more than 10 tons then rolled into the hole, crushing Buck. A backhoe operator was summoned to lift the root ball, Jones said. Buck was pronounced dead at the scene.